Wool and Wheel: A Snicker of Magic. On Saturday, I came home to find an unexpected package in the mail...a book-shaped package. 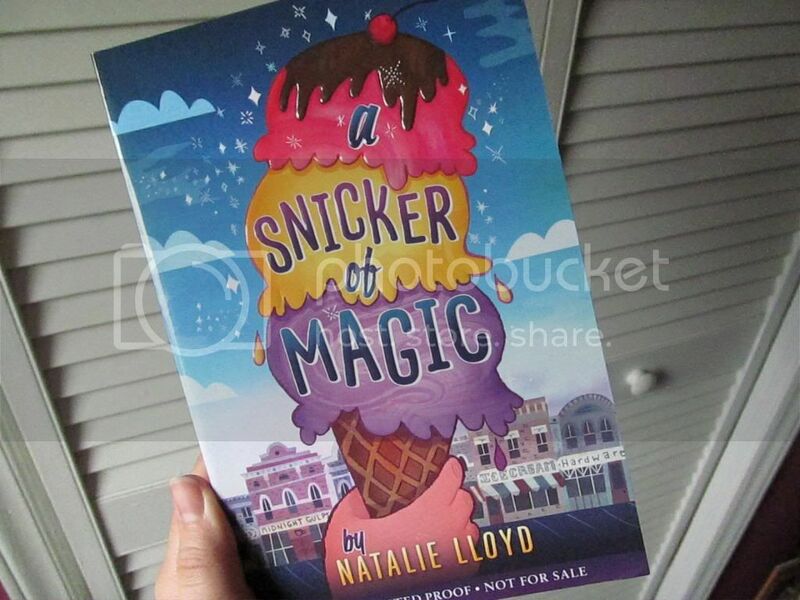 And it was the very best sort of surprise that it could have possibly been: a galley copy of Natalie Lloyd's upcoming novel, A Snicker of Magic! "Midnight Gulch used to be a magical place, a town where people could sing up thunderstorms and dance up sunflowers. But that was long ago, before a curse drove the magic away. Twelve-year-old Felicity knows all about things like that; her nomadic mother is cursed with a wandering heart. Felicity wants to stay in Midnight Gulch more than anything, but first, she'll need to figure out how to bring back the magic, breaking the spell that's been cast over the town . . . and her mother's broken heart." I've been reading Natalie's "nonfiction" (the magazine column she used to write, her blog, and her book Paperdoll) for years now, and ever since she posted snippets of fiction on her blog in the past, I've been hoping she'd write a novel. And her debut novel is nothing less than magical. A Snicker of Magic drew me in right from the beginning. I tried to pace myself because while I just wanted to read it all the time (seriously, I carried it around with me, hoping I'd have a moment to read a bit here or there), I also wanted to make it last as long as possible. I didn't want it to end. Natalie's writing style is so wonderful (if you've read anything she's written, you'll know what I mean). Her descriptions are the perfect balance- never overly long or flowery, but so beautifully written that I can see everything playing out in my mind. I love the quirky mountain setting of this book. I've lived in Virginia my whole life, and some books just capture that Southern, homey feel perfectly, and this is one of them. (Though of course Midnight Gulch is in Tennessee, not Virginia. By the way, if you think that Virginia isn't really "Southern", don't you dare let anyone from my part of the state hear you say that. :) And can I just say that I absolutely adore the fact that the Avett Brothers inspired Natalie's book and that the Threadbare Brothers are loosely based on them? The Avett Brothers make some of my favorite music ever. There are so many awesome things about this novel, but the best things are probably the characters. I honestly loved every single one of them. (And there are a lot!) The main character, Felicity Juniper Pickle (one of the best character names ever! ), is so fun and spunky and I can definitely relate to her nauseous reaction to public speaking. :) Jonah was so sweet and he makes me want to do more little random acts of kindness, though of course his aren't random at all. Frannie Jo was adorable, and oh my goodness, I absolutely loved Cleo (she's a crazy crafter/quilter!) and Boone. And those are just some of Felicity's family members. Don't even get me started on the hilarious townspeople. (I just have to mention a couple. Day Grissom! He was great. And Elvis Phillips. He sings and dances on the sidewalk in honor of his namesake. :) Even though there are lots of characters, I never had to try to figure out who was who: they're all so quirky and distinct that it's no trouble keeping them straight. One of my favorite parts is when the Pickle/Harness gang goes to Snapdragon Pond. It's not an incredibly important, dramatic scene. But I just love the fact that they're all wearing fairy wings (even Boone...ha) and how Felicity describes the pond and her talk with her mom in the tree and the fact that Day Grissom shows up at the end. :) It's wonderful. A Snicker of Magic has everything: gorgeous writing, a charming setting, a whole cast of quirky characters, and a girl learning about family and love and home. Plus a whole lot of sweetness (that could possibly have something to do with all of the ice cream in this story :). It releases on February 25th! Kristin, I am beaming!! I am SO so happy you liked the book. And hearing that you loved the characters just makes my heart spin. Aunt Cleo would love you, too! ;) To know it made you snort and cry is wonderful. I kind of want to highlight the line about Sarah Addison Allen and paste it to my ceiling. Also, I shall also note that I totally affirm your thoughts on Virginia: you are most definitely in the south. ;) Seriously though, thank so much for reading and saying so many kind things! You are spindiddly. Great review!! I am SO excited for this debut! !